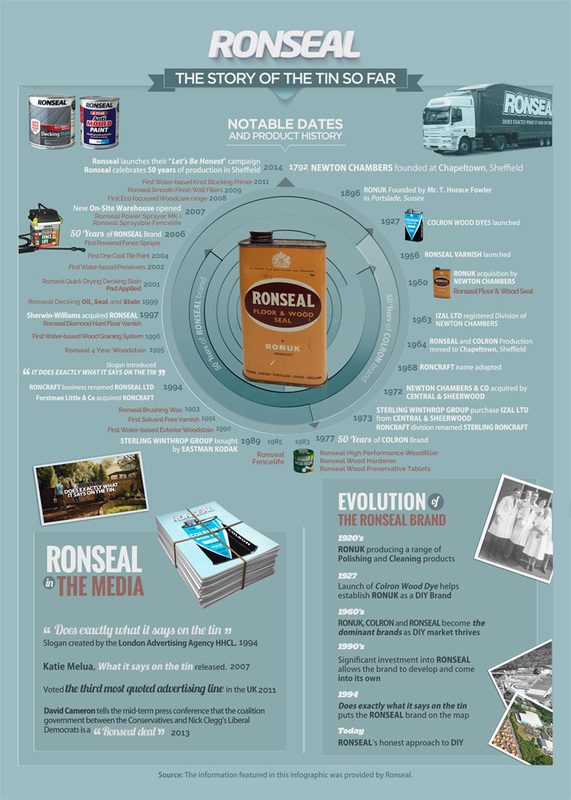 DIY Giants Ronseal offer us a look into their past with a nice infographic as they look back over 50 years in the Home Improvement market. Ronseal is one of the first names many people think of when they talk about DIY, which is probably due to their clever marketing campaign which has made their ‘does exactly what it says on the tin’ slogan an everyday phrase in our society. It was voted the UK’s third most quoted advertising line in 2011. The public awareness of their brand is perhaps most visible in David Cameron mentioning them when he described the coalition with the liberal democrats as a “Ronseal deal”. DIY Doctor is proud to stock Ronseal products in the DIY Superstore where we only stock leading brands and innovative products which are professional quality tools of the trade that we would be happy to use ourselves. To celebrate 50 years since they have relocated to Sheffield, Ronseal have provided an insight into their history. It provides some fascinating insights into how they managed to go from strength to strength through a combination of great products, determination and clever advertising. DIY Doctor pride ourselves on only stocking products and tools in our toolstore that we would be happy to use in our own homes. The idea that the outside of the tin explains exactly what is in it appeals to our sense of plain speaking that we hope is evident on DIY Doctor too. Nowadays Ronseal are a proud supporter of their adopted home’s local community, providing jobs in the local area while they strive to create even better quality products. With such a rich history the future looks bright for Ronseal and it’ll be interesting to see where they will be in another 50 years. Read more about Ronseal and their products on their website. Special offers on Varnish and Fence Treatments from Ronseal in DIY Doctor’s DIY Superstore – You’ll find it does exactly what it says on the tin!